The volumes comprising this multi-company building are grouped round an elevated central courtyard area atop a parking facility. Together they contain 23,000 square metres of office space. The largely unmodulated pentagonal main block, which rises from three to six storeys, is accessed from the street by two gateways themselves linked by an S-shaped route across the courtyards. The exterior is a taut design in silver-coloured aluminium cladding panels and uninterrupted strips of fenestration. It makes a stark contrast with the riot of colour inside. 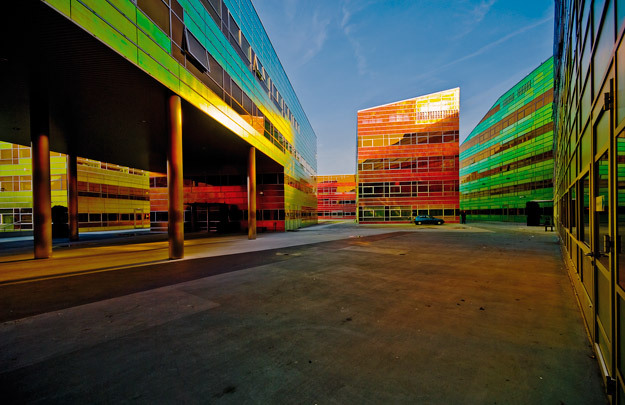 A special iridescent foil on the glazing is a constant source of changing colour effects depending on the sun's position in the sky and the angle at which the observer passes the building.